Pipe Burst – Who’s Responsible? 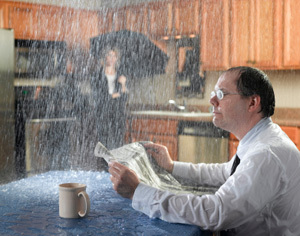 A pipe burst in a condominium can be everyone’s worst nightmare. Its usually a haphazard, unpredictable event causing significant damage, but the aftermath can be even more challenging to filter out than the displaced water. Both the Association and the affected unit owners will be carefully evaluating the nature of the damage, potential insurance coverage as well as causation, and all of this can certainly put a damper on carefree condo living. Since most major pipe bursts are random occurrences, the Association should initially focus its efforts on repairing the pipe, analyzing the damage and preparing a claim to be submitted to the Association’s general liability insurance carrier. The Association is obligated to maintain the common elements and the sooner it can obtain the insurance funding, the sooner the Association can replace certain items such as drywall (or in this case, wetwall) so as to prevent further damage to the common elements and potential health risks. But what about poor Mrs. Unit Owner who had her hard wood floor coverings, her fancy drapes and her antique furniture damaged by a haphazard pipe burst? Surely the Association’s insurance must cover those items too, right? Actually, Florida Statute 718.111(11), which governs insurance requirements for condominium associations, requires that an Association’s insurance specifically exclude coverage for these types of personal property found within a unit and puts the obligation squarely on the unit owner to self insure against this type of loss. So is Mrs. Unit Owner out of luck if she did not have insurance on her personal property? Not entirely. This is where the issue of causation comes into play–what caused the pipe to burst? It could indeed be that another unit owner was negligent in attempting to make alterations which inadvertently caused damage to the common element pipe. Alternatively, it could have been a situation where the Association was warned by a professional that a particular common element pipe was weak and preventative maintenance was never taken to address the issue. In either case, the negligent party could be on the hook for all the resulting damage, not only the damage to the common elements but also to the internal surfaces, components, fixtures and personal property contained inside all affected units.